At 1216 hours, Craig tapped his right foot. I recognized this as a signal used by persons wishing to engage in lewd conduct. Craig tapped his toes several times and moves his foot closer to my foot. … The presence of others did not seem to deter Craig as he moved his right foot so that it touched the side of my left foot which was within my stall area. Craig then proceeded to swipe his left hand under the stall divider several times, with the palm of his hand facing upward. This post has nothing to do with lewd sexual behavior in bathrooms, it’s about as random a post as I’ll ever write. But it does involve bathroom stance! I used a public bathroom the other day, as I often do in my travels. 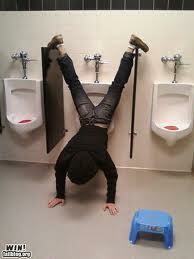 As I surveyed the rows of urinals to choose the perfect one, I was struck by one gentleman. At first I couldn’t figure out what was strange about him and why he caught my eye. I thought maybe it was his height, he was tall but not that tall. I didn’t want to stare and make it a point to get in and out of public bathrooms as quick as possible. It wasn’t until I had left the bathroom that it dawned on me why this guy had caught my eye. It was his stance! Maybe he was really effected by the Larry Craig scandal and didn’t ever want there to be any confusion but he was rocking the narrowest stance EVER! If it wasn’t the weirdest and I think an illegal thing in the world, I wish I had the presence of mind to snap a picture because when I say narrowest EVER I mean it. His feet were literally almost touching, if he really had to go and was rocking a really powerful stream, it would definitely knock him over. I’m not critiquing his or anyone else’s stance. You don’t need to institute an athletic stance, shoulder width apart is not required but I imagine you at least want to be comfortable and stable to ensure full control for the duration of evacuation. This entry was posted in Car Free, Uncategorized and tagged Bathroom, CarFree, CarFreeBrad.com, Craig, Larry Craig, Larry Craig scandal, Lascivious, Minneapolis-Saint Paul International Airport, Worcester. Bookmark the permalink.